Welcome back! This will conclude the “choose your own adventure” on Holy Women. Hopefully most of my posts in the future will be about my dissertation research on Anglo-Saxon prose (yes, that’s as narrow as I’ve gotten it so far). Moving away from holy women written by men to holy women written about themselves, I present #s 3 and 4: Julian of Norwich and Margery Kempe. Julian (1342-1416) was an anchorite in Norwich. As an anchorite she engaged in contemplative prayer in an institution of the church that was sanctioned, if still somewhat marginalized, by the church. Synopsis: Hers is actually two texts: the first recounting visions over the course of a few days, the second reflecting on those visions in the context of her later life and complex doctrinal issues. She focuses on the Trinity and especially Christ but says very little about sacraments. Themes: For those interested in the intersections of orality and literacy, I should note that she does claim to be illiterate. This could be part of a medieval modesty topos, but it nevertheless opens up conversation for what it meant to have been a “well-read”woman in medieval England (and is worth bringing up in comparison to figures like the Wife of Bath). Her visions are beautiful, sometimes frightening, and often moving. One of her most famous showings appears in her First Revelation, when God shows her “a little thing, the quantity of a hazelnut, lying in the palm of [her] hand, as it seemed, and it was round as a ball.” When she asks what it is, she hears, “It is all that is made” (I’ve modernized the spelling of Baker, p 9). The whole passage is tender but powerful, deftly confronting the microcosm/macrocosm in an extraordinarily intimate relationship with God. 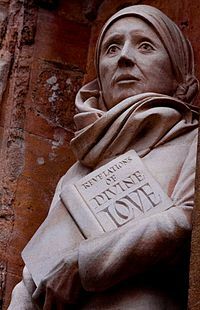 You can find more about Julian of Norwich at Luminarium, but I highly recommend the Norton Critical edition of The Showings of Julian of Norwich by Denise Baker. You can even borrow my copy. Margery is not a saint. Her writings are not particularly retrospective, nor even strictly autobiographical. Synopsis: Margery’s Book documents her life at home and abroad; on pilgrimage and on trial. It deals with the hardships and persecutions she suffers as a woman traveling on her own and blessed with weeping spells. Unlike Julian, Margery constructs her narrative around episodic patterns rather than chronology. Themes: Barry Windeatt writes, “[c]hronology has given way to patterns of episodes recounting loss, shame, and powerlessness, succeeded by vindication and precarious triumph, and followed in turn by renewed disempowerment and beleaguerment” (The Book of Margery Kempe, 26). But don’t get the impression that she’s just a victim of (admittedly, rather peculiar) circumstance; an especially memorable scene recounts her buying back her chastity from her husband. Nevertheless, Windeatt sees her story as a updated hagiography: “Here the assaults and tortures of a martyrdom have been updated into a middle-class housewife’s endurance, for her convictions, of her society’s contemptuous humiliation and character assassination” (19, 20). I got defensive when I first read that; it felt like an indictment of her authority, authenticity, and even her life. But those three aspects are important for us to discuss with each other and with our students. Teaching this to undergrads would be fascinating. Who would be sick of her? Who would distrust her? Who would find the whole thing fascinating, and even inspiring? Who would wonder, since it’s not an instructional book, why she really had it written down? I’m not particularly fond of Margery’s book, but I can identify with her person/character, and I’d love to know what you, thoughtful reader, think of her, too. Baker, Denise N., ed. The Showings of Julian of Norwich. New York: W. W. Norton, 2005. Windeatt, Barry, ed. The Book of Margery Kempe. Harlow, UK: Pearson Education, 2000.